Goals, objectives , and projections – common words that come to mind when thinking about the process of planning. Creating a plan is very similar to mapping out a road trip. We choose a destination (specify a goal), evaluate alternative routes, and determine a specific course. We then follow the plan step by step, ticking off each task until we finally reach our goal. In theory, it’s a straightforward process. But what happens when you reach an obstacle that has the potential to knock you off course? We all experience roadblocks. Even with the best laid plans, we can’t always forecast a roadblock that lies ahead. Although we can plan for contingencies, we can’t anticipate them all due to an infinite set of variables that inevitably come into play. We have to accept that some roadblocks cannot be accounted for on paper because it is often in in the act of DOING that the roadblocks appear. Fortunately, not only are humans very resilient, but we are endowed with problem-solving abilities that are designed to ensure the survival of our species. When we are met with obstacles, we are challenged to discover ways to overcome them. In the context of evolution, overcoming them ensures survival, while succumbing to them may lead to extinction. In the modern world, how well we handle roadblocks will determine to what extent we experience success and personal growth. Those who learn to navigate setbacks will go on to accomplish great things. And those who don’t will stagnate. Change the way you view the situation; strive to see the roadblock from another point of view. Instead of seeing it as a blocked roadway (negative), you could think of it as an opportunity to discover a new route (positive). 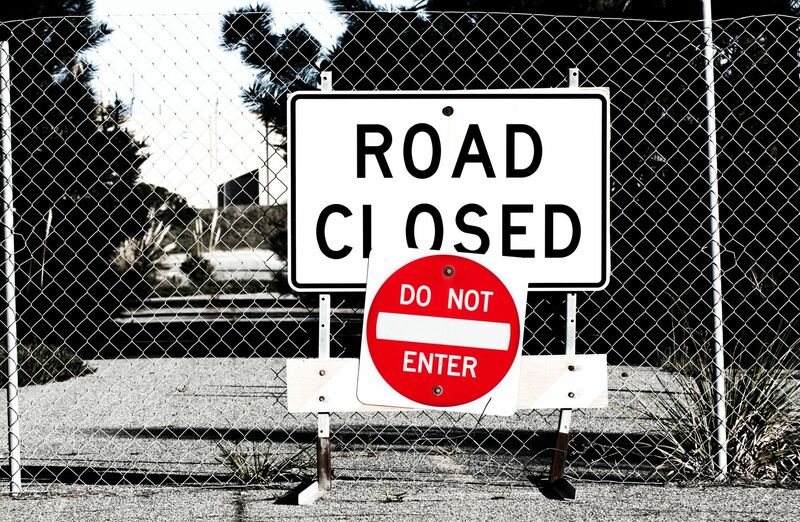 A “Road Closed“ sign is usually accompanied by a “Detour” sign. Therefore, unlike a “Stop” sign, it simply means that you must take an alternate route. Creating an alternative may mean that you have to think harder, be more creative, or take more time to reach your destination. However, the challenge of learning a new way of doing things provides an opportunity for personal growth. In the same way that you would consult your GPS system, seek to engage others. Sometimes when we are hyper-focused on a goal, we develop myopic thinking, which can hamper our ability to see the big picture. Opening yourself up to suggestions from others can help to expand your options. It may be especially helpful to consult with people outside of your normal social circle because if you limit your conversations to people who share the same perspective as you, you may not receive any ideas that differ from your own. Don’t lose sight of your objective, which is simply to accomplish your goal. Therefore, it really doesn’t matter which road gets you there. Don’t confine yourself by becoming emotionally attached to the initially planned route. If you reach a bend in the road, then go with it. If you reach a hindrance, plan to go around it. Never rule out any option without contemplating its merit. Rigidity leads to stress. Instead, think about words such as fluidity and flow. Remember there is always more than one route to any given destination, with one route not necessarily being better than another. Have the resolve that you WILL accomplish your goal, and embrace the growth-promoting challenges that will inevitably accompany you along the way. When encountering roadblocks, as with life in general, there is not an ultimate BEST or ONLY route. There is only the route that you ultimately choose to take – which actually ends up being the best because it got you to where you needed to go. Lastly, consider that a detour can intrinsically make the trip (and goal) more rewarding. When was the last time you faced a roadblock? How did you handle it? Which of the suggestions above do you find most helpful?